Back pain, a significant source of morbidity in our society, is related to the degenerative changes of the intervertebral disc. At present, the treatment of disc disease consists of therapies that are aimed at symptomatic relief. This shortcoming stems in large part from our lack of understanding of the biochemical and molecular events that drive the disease process. The goal of this study is to develop a model of early disc degeneration using an organ culture. This approach is based on our previous studies that indicate that organ culture closely models molecular events that occur in vivo in an ex vivo setting. To mimic a degenerative insult, discs were cultured under low oxygen tension in the presence of TNF-α, IL-1β and serum limiting conditions. Treatment resulted in compromised cell survival and changes in cellular morphology reminiscent of degeneration. There was strong suppression in the expression of matrix proteins including collagen types 1, 2, 6 and 9, proteoglycans, aggrecan and fibromodulin. Moreover, a strong induction in expression of catabolic matrix metalloproteinases (MMP) 3, 9 and 13 with a concomitant increase in aggrecan degradation was seen. An inductive effect on NGF expression was also noticed. Although similar, nucleus pulposus and annulus fibrosus tissues showed some differences in their response to the treatment. Results of this study show that perturbations in microenvironmental factors result in anatomical and gene expression change within the intervertebral disc that may ultimately compromise cell function and induce pathological deficits. This system would be a valuable screening tool to investigate interventional strategies aimed at restoring disc cell function. Intervertebral disc (IVD) degeneration is believed to be one of the major underlying causes of spinal pathology. Low back conditions are ubiquitous, accounting for approximately $100 billion in direct health care-related costs in the US in 2008 [1, 2]. Published reports estimate a higher prevalence of degenerative discs as age increases, and nearly 90% of people over 60 years have at least one degenerative disc on a magnetic resonance imaging . Clinical manifestations stemming from IVD degeneration vary based on the grade of degeneration and associated spinal pathology. IVD degeneration typically occurs through a progressive and stepwise cascade of events which results from the alteration of cellular and extracellular matrix composition of the nucleus pulposus (NP) and annulus fibrosus (AF) [4, 5]. Early changes in human disc degeneration often occur at the cellular level without an appreciable disruption of the native disc architecture. As the degenerative cascade progresses, structural abnormalities appear within the disc, resulting in macroscopic changes and compensatory healing responses. Higher-grade degenerative processes often lead to clinically evident conditions that may require medical or surgical management. Current research attempts at investigating disc degeneration have focused on models thought to represent the late-stage degenerative changes [6–16]. Inevitably, induction of the degenerative cascade in these models requires the mechanical disruption of the AF and creating structural and morphological changes that mimic late degeneration [15–17]. This naturally results in the inability to focus on early cellular and molecular changes. Other models have described the use of supra-physiological mechanical loading of functional spinal units with external apparatus . While this type of approach does not disrupt the annulus, achievement of controlled and consistent degeneration may rely on uniformity of mechanical loading, require longer induction periods, and bring higher costs often associated with in vivo studies. As an alternative to some of the in vivo models, other studies have described disc organ culture systems to investigate disc degeneration [17, 19–25]. Some of these reports are feasibility studies designed to describe and characterize techniques to maintain a viable disc organ culture [17, 19, 21], whereas other studies use enzymatic digestion of the proteoglycan matrix or needle puncture injury to replicate the cellular and architectural changes that occur during disc degeneration without intrinsic action of proinflammatory and catabolic mediators (as postulated in human degenerative disc disease, or DDD) [25–27]. To the best of our knowledge, our study is the first attempt to report an in vitro model that induces physiological disc degeneration and allows the investigation of early disc degeneration without annulus disruption. Animal experiments were approved by the Institutional Animal Care and Use Committee. Wistar rats (250 to 300 g; Charles River Laboratories International, Inc., Wilmington, MA, USA) were euthanized with CO2 and the spinal columns were removed en bloc under aseptic conditions. Lumbar IVDs comprising the vertebral endplates, AF and NP were harvested (six discs per animal). Soft tissues and posterior elements were removed, and discs were rinsed in saline solution before being placed in 48-well culture plates. All experimental specimens were cultured in an hypoxia workstation (Invivo2; Ruskinn Technology Ltd, Pencoed, UK) in 1% O2, 5% CO2, and 93% N2 in Dulbecco's modified Eagle's medium (DMEM) containing 1% fetal bovine serum (FBS), tumor necrosis factor-alpha (TNF-α) 100 ng/mL, interleukin-1beta (IL-1β) 10 ng/mL (R&D Systems, Inc., Minneapolis, MN, USA), 50 μg/mL L-ascorbate, 40 mM NaCl, antibiotics, and antimycotics (Cellgro; Mediatech, Inc., Manassas, VA, USA). Concentration of cytokines was based on the literature [28, 29]. Importantly, slightly higher doses of cytokines were chosen to compensate for the lack of systemic feedback present from immune and neuronal cells during degeneration. Control groups were cultured in DMEM containing 20% FBS, 50 μg/mL L-ascorbate, 40 mM NaCl, and antibiotics. The discs were maintained for 3 and 10 days. The complete medium was replaced every 2 days for all groups. To measure the diffusion in the organ-cultured discs, 5 to 10 μg/mL of QuantiLum Firefly luciferase (61 kDa) (Promega Corporation, Madison, WI, USA) and 50 to 100 μg/mL of Renilla luciferase (38 kDa) (Prolume Ltd., Pinetop, AZ, USA) were added to the medium. After 24 hours in culture, discs were immersed in Hank's balanced salt solution supplemented with 40 mM NaCl. An incision was made through the middle of the AF with #15 scalpel blades, and the two halves of the disc were opened. The NP was then scooped out with a Meyhoefer Curette (World Precision Instruments, Sarasota, FL, USA) (Figure 1A). Tissue was harvested, and a Dual-Luciferase Reporter Assay System (Promega Corporation) was used for measurements of Firefly and Renilla luciferase. Quantification was carried out with a luminometer (TD-20/20; Turner Designs, Sunnyvale, CA, USA). All analysis was carried out in triplicate. Establishment of organ culture model of disc degeneration. (A) Schematic showing disc organ culture setup. Culturing discs under low oxygen partial pressure (pO2) in hyperosmolar, nutritionally limiting media and exposure to proinflammatory cytokines mimic molecular changes characteristic of early disc degeneration. NP, nucleus pulposus; AF, annulus fibrosus; FBS, fetal bovine serum. (B,C) Measurement of luciferase diffusion in nucleus pulposus (NP) tissue after 24 hours. Both Firefly (61 kDa) and Renilla (38 KDa) luciferase diffuse in the tissue in a concentration-dependent fashion. Results are shown as the mean ± standard error for three independent experiments performed in triplicate. *P <0.05. (D) Histological sections were stained for apoptotic cells. Tumor necrosis factor-alpha (TNF-α)-treated and interleukin-1beta (IL-1β)-treated intervertebral discs demonstrated significantly higher numbers of apoptosis-positive cells (d) than the untreated control group (b) after 3 days in culture (DAPI: a and c). Ctr., control group; DAPI, 4'-6-diamidino-2-phenylindole; Exp., experimental group; TUNEL, terminal deoxynucleotidyl transferase-mediated dUTP-biotin nick end-labeling. (E) Histological analysis of disc after treatment. Sections are stained with Alcian blue and hematoxylin-and-eosin counter staining and photographed with a low-magnification (4×) lens (a). Panels (b) and (c) were examined under high magnification (20×). Aberrant cellular hypertrophy and matrix degradation of NP tissue in treated disc were observed after 3 and 10 days. Representative findings of three separate experiments (n = 3 discs/group per experiment) are shown. For in situ identification of apoptotic cells, a TACS 2 TdT-Fluor In Situ Apoptosis Detection Kit was used on histological sections in accordance with the instructions of the manufacturer (Trevigen Inc., Gaithersburg, MD, USA). In brief, 8-μm tissue sections from paraffin-embedded discs were deparaffinized in xylene, rehydrated, and pretreated with proteinase K solution for 15 minutes at 37°C. The slides were rinsed twice in deionized water and incubated with 50 μL of labeling reaction mixture for 1 hour at 37°C in a humidified chamber. After washing with phosphate-buffered saline (PBS), 50 μL of Strep-Fluor solution was applied, and the slides were incubated for 20 minutes. The slides were washed three times in PBS and mounted under glass coverslips using fluorescence mounting media (Vector Laboratories, Burlingame, CA, USA) and analyzed under a fluorescence microscope using a 495-nm filter (Nikon eclipse TE 2000-U; Nikon, Tokyo, Japan). Whole disc units, including the endplates, were fixed in 10% formaldehyde in PBS for routine histological and immunohistochemical evaluation. After fixation, disc units were serially dehydrated in alcohol. Decalcification was accomplished with 12.5% ethylenediaminetetraacetic acid (EDTA) (pH 7.4) followed by paraffin embedding. The tissue blocks were sectioned parallel to the endplate (6 to 8 μm in thickness), and sections were deparaffinized in xylene and rehydrated through graded ethanol and stained with Alcian blue, eosin, and hematoxylin. For localizing matrix metalloproteinase 3 (MMP-3), sections were incubated with rabbit monoclonal MMP-3 antibody (EP1186Y; Abcam, Cambridge, MA, USA) in 2% bovine serum albumin in PBS at a dilution of 1:250 at 4°C overnight. After washing of the sections, the bound primary antibody was incubated with Alexa fluor-488 conjugated anti-rabbit secondary antibody (Invitrogen Corporation, Carlsbad, CA, USA) at a dilution of 1:100 for 1 hour at room temperature. Sections were mounted in mounting media containing DAPI (4',6' diamino-2-phenylindole) and visualized with a fluorescence microscope (Olympus, Tokyo, Japan). The discs were collected and the AF was separated from the NP. The tissues were stabilized in RNA later in accordance with the instructions of the manufacturer (Ambion, Inc., Austin, TX, USA) and stored at −80°C. Total RNA was extracted with an RNeasy Micro kit in accordance with the instructions of the manufacturer (Qiagen Inc., Valencia, CA, USA). The DNA template from the RNA preparation was removed by using the DNase I digestion. cDNAs were made by using 0.5 μg of total RNA, and quantitative real-time reverse transcription-polymerase chain reaction (RT-PCR) was performed with SYBR Green PCR Master Mix (Applied Biosystems, Foster City, CA, USA) on an ABI 7900 HT sequence detection system. PCR was initiated at 95°C for 10 minutes (to activate the AmpliTaq polymerase) followed by a 40-cycle amplification phase (95°C for 15 seconds, anneal/extend at 60°C for 60 seconds). Melting curve analysis was performed to ensure specific PCR product while excluding primer dimers. The data were normalized to the endogenous control, 18S rRNA message, in each sample and were represented as a relative change to the control. All of the primers used were synthesized by Integrated DNA Technologies, Inc. (Coralville, IA, USA). Sequences for primers are presented in Table 1. F, forward primer; R, reverse primer; IL-1β, interleukin-1beta; MMP, matrix metalloproteinase; NGF, nerve growth factor; TNF-α, tumor necrosis factor-alpha. Expression of aggrecan degradation products, MMP-3, MMP-9, and MMP-13 were evaluated by means of Western blot analysis. AF and NP tissue was washed with cold PBS and was extracted with lysis buffer (Cell Signaling Technologies, Danvers, MA, USA) at 4°C for 24 hours. The lysis buffer contains the following: 20 mM Tris-HCl (pH 7.5), 150 mM NaCl, 1 mM Na2EDTA, 1 mM EGTA (ethylene glycol tetraacetic acid), 1% Triton, 2.5 mM sodium pyrophosphate, 1 mM β-glycerophosphate, 1 mM sodium vanadate (Na3VO4), 1 μg/mL leupeptin, 1 mM PMSF (phenylmethylsulfonyl fluoride), and 1X complete protease inhibitors (Roche Molecular Biochemicals, Indianapolis, IN, USA). The tissue lysate was centrifuged for 10 minutes at 14,000g to collect the clear tissue extract. Protein concentration in the extract was determined by using a Pierce BCA protein assay kit (Thermo Fisher Scientific Inc., Rockford, IL, USA). To detect aggrecan core protein fragments, lysates were treated with chondroitinase ABC (Sigma-Aldrich, St. Louis, MO, USA) 0.1 U/mL in 50 mM Tris-acetate EDTA buffer at 37°C for 1 hour. Protein extracts (10 μg) were centrifuged at 4°C for 2 minutes at 14,000g and resolved on NuPAGE 4-12% Bis-Tris Gels (Invitrogen Corporation). Proteins were transferred onto Immobilon-P Membrane (Millipore Corporation, Billerica, MA, USA). The membrane was blocked with 5% nonfat dry milk in PBS with 0.1% Tween-20 and incubated overnight at 4°C in 3% nonfat dry milk in PBS with 0.1% Tween-20 with appropriate antibody (mouse monoclonal [BC-3] to aggrecan ARGxx, rabbit monoclonal [EP1186Y] to MMP-3, rabbit monoclonal [EP1254] to MMP-9, and rabbit polyclonal to MMP-13; all from Abcam). The binding of the secondary antibody was detected by enhanced chemiluminescence (ECL-Plus; GE Healthcare, Little Chalfont, Buckinghamshire, UK). Results were normalized to the content of tubulin detected with monoclonal antibody beta-tubulin (E7; Developmental Studies Hybridoma Bank at the University of Iowa, Iowa City, IA, USA). Data were represented as mean ± standard error from three independent experiments. Statistical analysis was performed with Sigma Plot 11.2 statistical software (Systat Software, Inc., San Jose, CA, USA). Student t test or, where appropriate, Mann-Whitney test was used to measure statistical significance (P <0.05). To characterize the diffusion of proteins of different molecular-weight proteins in the organ culture disc, we incubated discs with Firefly (61 kDa) and Renilla (38 kDa) luciferase (Figure 1A). After 24 hours of incubation, the NP was dissected and analyzed for the luciferase activity. Both the Firefly and Renilla luciferase show an increase in luminescence in a concentration-dependent manner within the NP (Figure 1B,C). To ensure that our model reflects cellular and histological changes often seen with early disc degeneration, an assessment of cell viability was performed with the TUNEL (terminal deoxynucleotidyl transferase dUTP nick end labeling) assay. 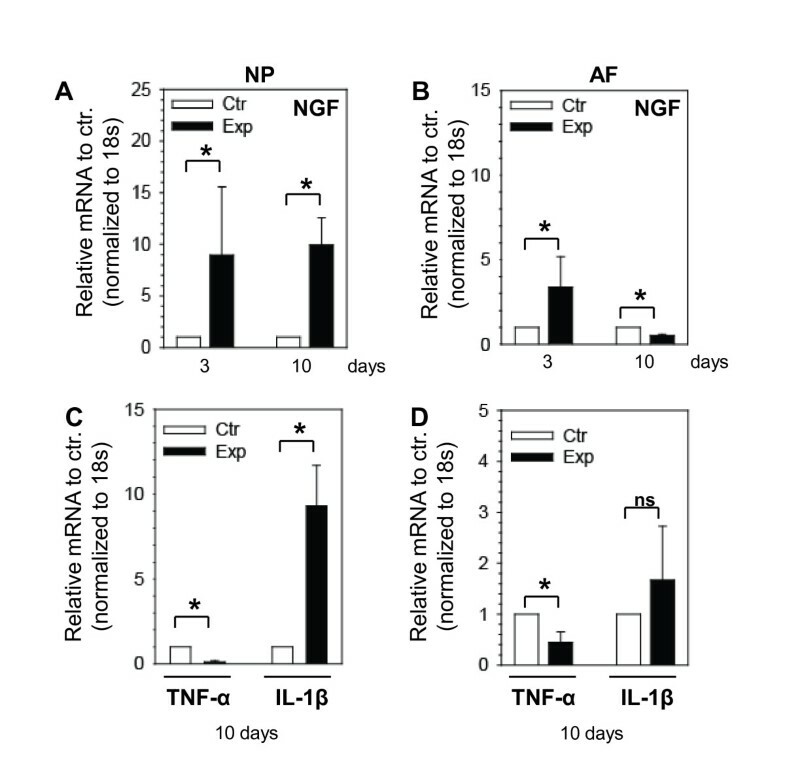 Figure 1D shows that TNF-α and IL-1β treatment for 3 days results in an increase in the number of apoptotic cells (Figure 1D-d) both in the NP and AF in comparison with the untreated control discs (Figure 1D-b). We performed a histological analysis of the organ-cultured discs to assess changes in cellular morphology and tissue organization (Figure 1E). Control untreated discs showed lamellar organization of the AF with well-circumscribed NP containing abundant proteoglycan-rich Alcian blue-stained extracellular matrix. NP cells showed well-defined eosinophilic cytosol with prominent cell nuclei. After 3 days of treatment with TNF-α and IL-1β, the discs demonstrated a notable loss of eosinophilic staining of the cytoplasm of the central NP cells. Although tissue architecture was preserved, a decrease in the Alcian blue staining of the extracellular matrix was noted with signs of cell loss and a concomitant increase in vacuole formation. At 10 days after treatment, additional changes of the cellular architecture were observed; the most obvious was a loss of Alcian blue staining of the extracellular matrix. Additionally, the eosinophilic staining of the NP cytosol was nearly gone and lacunae previously occupied by cells were empty. AF architecture, however, was preserved throughout the 10 days of treatment (Figure 1E, bottom row). Real-time RT-PCR was used to determine the effect of proinflammatory cytokines TNF-α and IL-1β and limited nutrition on the expression of both anabolic and catabolic regulators of disc homeostasis. 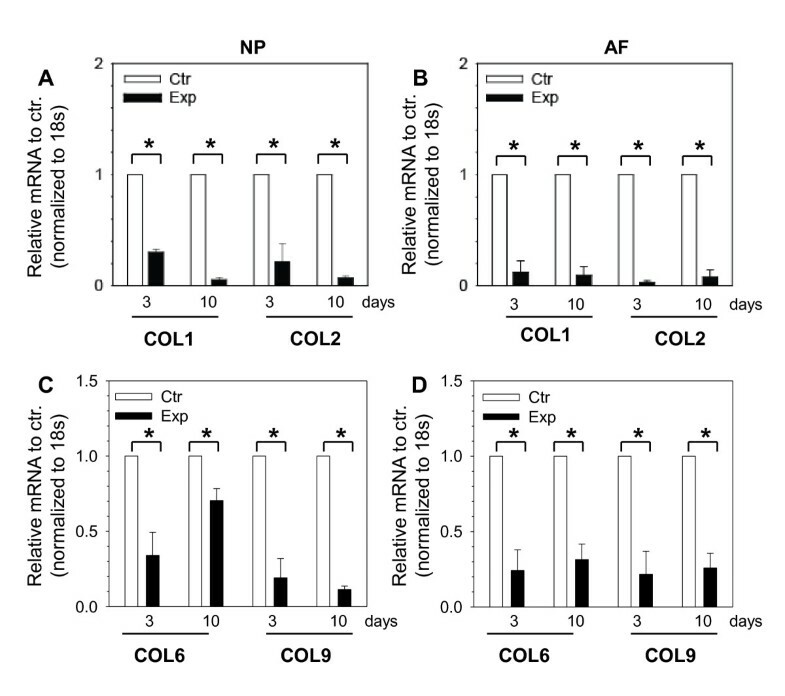 A significant decrease was seen in collagen type I, collagen type II, and collagen type VI expression by both NP and AF cells after 3 and 10 days of treatment (Figure 2A-C). Interestingly, collagen type IX expression decreased in only the AF at 10 days (Figure 2D). 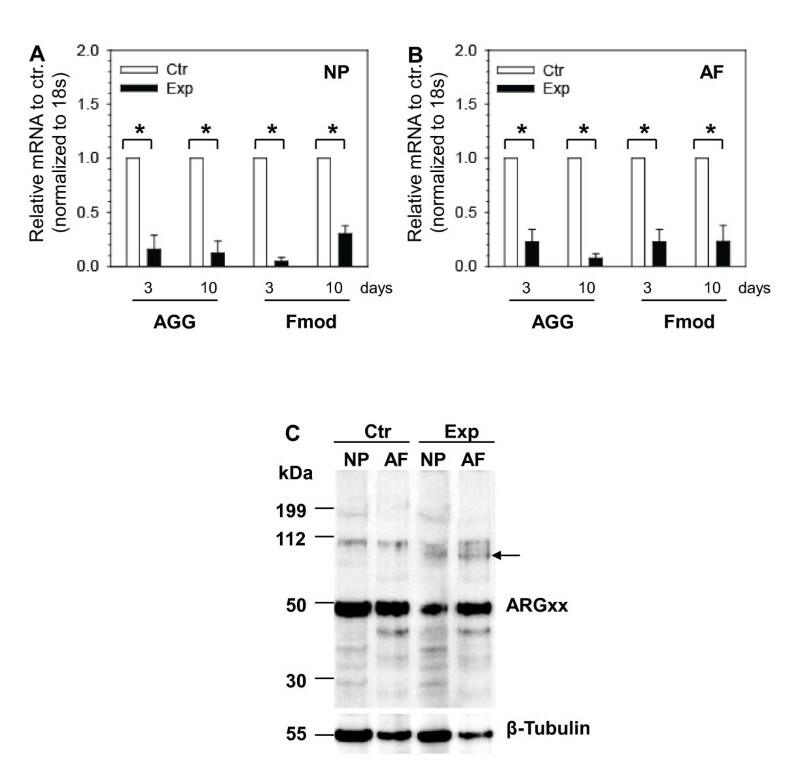 To investigate changes in expression of important proteoglycan matrix components of the tissues, we studied the expression pattern of aggrecan and fibromodulin and found a significant downregulation in both the NP and AF after 3 and 10 days in organ culture (Figure 3A,B). To investigate whether a decrease in aggrecan expression is coupled with an increase in aggrecan breakdown, Western blot analysis of NP and AF tissue lysates was performed. Owing to the lower cellularity of the AF in comparison with the NP tissue, a smaller proportion of cellular protein was observed for AF. Figure 3C shows that, in treated samples, anti-ARGxx antibody detects additional cleaved aggrecan core protein fragments in comparison with untreated controls (arrow). Collagen gene expression is suppressed in organ culture model of disc degeneration. Expression of important disc matrix collagens decreases with tumor necrosis factor-alpha, interleukin-1beta, and limited nutrition. Expression of type 1 collagen (COL1) and type 2 collagen (COL 2) is significantly suppressed in (A) nucleus pulposus (NP) and (B) annulus fibrosus (AF) tissues of treated discs at 3 and 10 days. Note a significant decrease in type 6 collagen (COL 6) after the treatment in (C) NP and (D) AF. Type 9 collagen (COL 9) expression is decreased only in AF after 10 days of treatment (C,D). Results are shown as the mean ± standard error for three independent experiments (n = 6 discs/group per experiment). *P <0.05. Ctr., control group; Exp, experimental group. Matrix gene expression is altered in organ culture model of disc degeneration. Real-time reverse transcription-polymerase chain reaction analysis of aggrecan (AGG) and fibromodulin after treatment. There is a significant downregulation in expression of AGG and fibromodulin (Fmod) mRNA in (A) nucleus pulposus (NP) and (B) annulus fibrosus (AF) tissues of treated discs. Results are shown as the mean ± standard error for three independent experiments. *P <0.05. (C) Presence of AGG fragments as analyzed by Western blotting in NP and AF tissue lysates after 3 days in culture. Arrows indicate the presence of additional AGG fragments recognized by anti-ARGxx antibody in the treated tissues. Representative findings of two independent experiments (n = 6 discs/group per experiment) are shown. Ctr., control group; Exp, experimental group. We performed an analysis to investigate whether treatment with cytokines and nutritional deficiency results in upregulation of genes encoding catabolic enzymes. Figures 4A and 4B show a significant induction in MMP-3 expression in NP and AF tissues at 3 and 10 days after treatment. Expression of MMP-3 after 3 days of treatment was also analyzed by Western blot analysis (Figure 4C). Interestingly, the increase in MMP-3 protein expression is more prominent in the AF tissue in comparison with the NP. Immuoflorescence analysis was used to confirm the expression and localization of MMP-3 in the treated discs. Figure 4D shows a positive staining of MMP-3 in NP and AF cells. Outer AF cells demonstrate enhanced expression of MMP-3 in comparison with inner AF cells. We then examined expression of MMP-9 and MMP-13 in treated discs (Figure 5A,B). 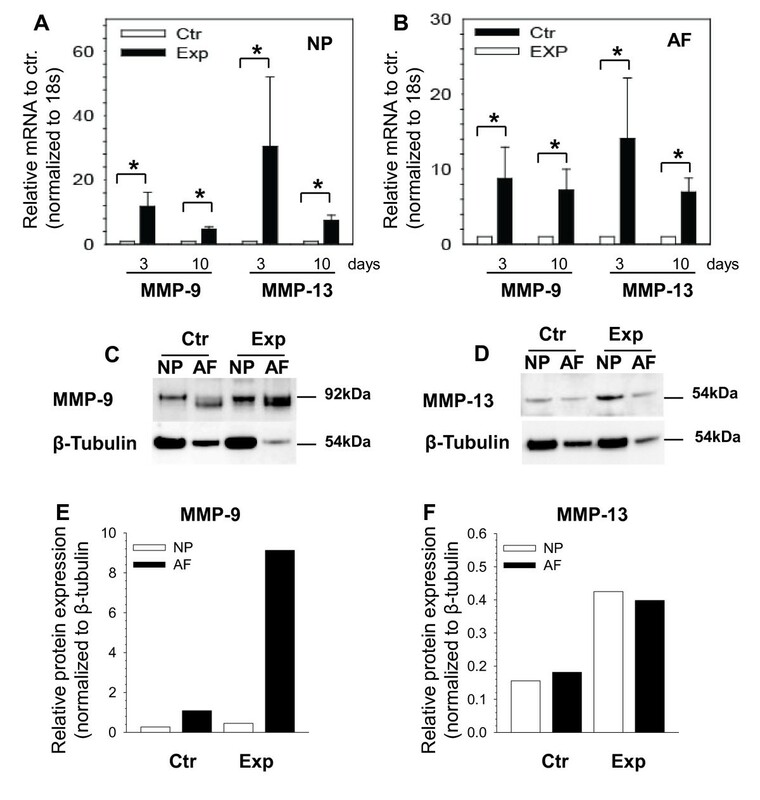 Similar to MMP-3, both MMP-9 and MMP-13 show increased mRNA expression in both of the tissues (Figure 5A,B). Western blot analysis was also used to measure MMP-9 and MMP-13 expression in disc tissues. Figure 5C shows a significant induction in MMP-9 in AF cells of the treated disc and a smaller increase in MMP-9 expression in the NP tissue. In contrast to MMP-9 protein, MMP-13 protein shows a prominent increase in NP when compared with the AF tissue (Figure 5D). Overall, these results demonstrated an enhanced expression of catabolic MMPs in the disc after the treatment. Catabolic gene expression is upregulated by tumor necrosis factor-alpha, interleukin-1beta, and limited nutrition. Expression of matrix metalloproteinase 3 (MMP-3) mRNA in nucleus pulposus (NP) (A) and annulus fibrosus (AF) (B) tissues. Expression is significantly induced in both tissues after the treatment for 3 and 10 days. Results are shown as the mean ± standard error for three independent experiments (n = 6 discs/group per experiment). *P <0.05. (C) Western blot analysis of MMP-3 in NP and AF tissue lysates after 3 days in culture confirms the expression of MMP-3. (D) Representative photomicrographs of the immunohistochemical reactivity for MMP-3 in tissue sections from treated discs for 3 days (c,d). Sections were also stained with Alcian blue and hematoxylin and eosin (HE) for visualization of morphological details (a,b). Owing to extremely low signal intensity, data for untreated tissue sections are not shown. Original magnification: 20×. (E) The expression of MMP-3 tends to increase in the experimental group. Ctr., control group; Exp, experimental group. Effect of tumor necrosis factor-alpha, interleukin-1beta, and limited nutrition on matrix metalloproteinase (MMP)-9 and MMP-13 expression. 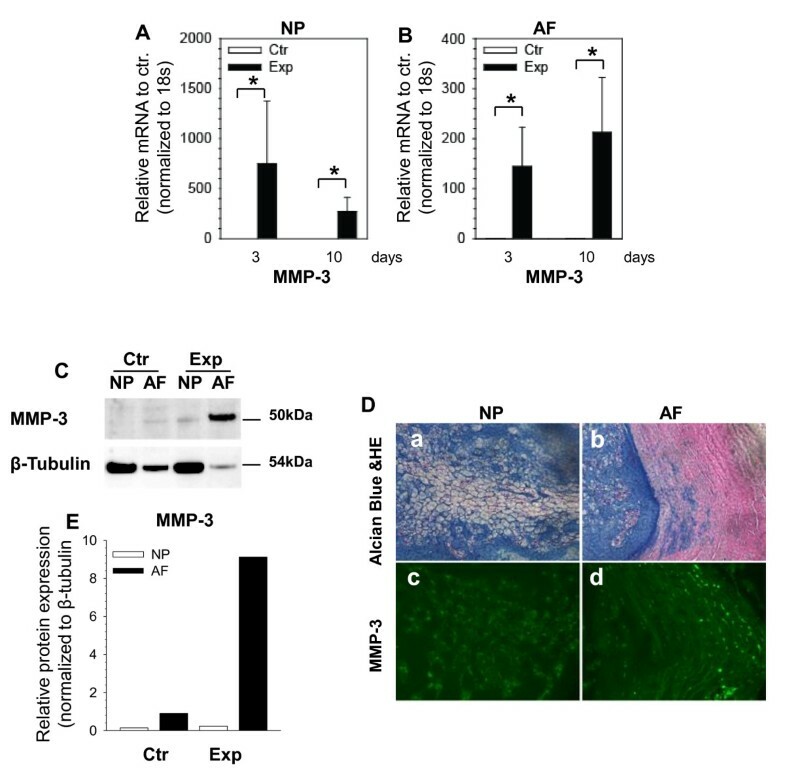 Expression analysis of MMP-9 and MMP-13 mRNA in nucleus pulposus (NP) (A) and annulus fibrosus (AF) (B) tissues after the treatment. Both MMP-9 and MMP-13 are significantly upregulated after the treatment. Results are shown as the mean ± standard error for three independent experiments (n = 6 discs/group per experiment). *P <0.05. Western blot analysis of MMP-9 (C) and MMP-13 (D) in NP and AF tissue lysates after 3 days in culture. The expression of MMP-9 (E) and MMP-13 (F) is increased in the treated samples. Ctr., control group; Exp, experimental group. Since the disc organ culture is an in vitro system, a direct assessment of pain and inflammation without the involvement of neuronal and immunological components is not feasible. However, to get an indirect assessment of whether the degenerative changes in the discal tissues elicit changes in the expression of genes that activate neuronal and immune components resulting in pain and inflammation changes in expression of marker genes such as nerve growth factor (NGF), TNF-α, and IL-1β were measured. Figures 6A and 6B show that 3 days of treatment results in increased NGF expression by the NP and the AF. This increase in expression is sustained in the NP tissue at 10 days, whereas a small decrease is noticed in the AF. Interestingly, whereas IL-1β demonstrated a strong increase in both tissues (Figure 6C), TNF-α exhibits a small decrease in expression after treatment (Figure 6D). Tumor necrosis factor-alpha (TNF-α), interleukin-1beta (IL-1β), and limited nutrition causes changes in expression of genes associated with pain and inflammation. Nucleus pulposus (NP) (A) and annulus fibrosus (AF) (B) were analyzed at the indicated days for nerve growth factor (NGF) expression by using quantitative reverse transcription-polymerase chain reaction (RT-PCR). At 3 days of treatment, NGF is significantly increased in NP and AF. At 10 days after treatment, the expression of NGF in NP was significantly increased but in AF showed a lower expression compared with the control. Expression analysis of TNF-α and IL-1β genes showed decreased expression of TNF-α after treatment in NP (C) and AF (D) tissues. IL-1β showed an increase in expression compared with untreated control. Results are shown as the mean ± standard error for three independent experiments (n = 6 discs/group per experiment). *P <0.05. Ctr., control group; Exp, experimental group; ns, not significant. The ubiquitous presence of symptomatic DDD is an increasing clinical problem with few reliable treatments. The etiology of DDD is likely multifactorial and remains elusive. Current surgical treatment options for DDD are based on the end-stage changes of the degenerative disc complex with or without concomitant neural compression or instability or both. Medical (non-surgical) management of DDD (specifically discogenic low back pain) centers around symptom relief with supportive measures, whereas surgical management focuses on ablation and reconstruction of the pathological disc. Currently, no specific cure exists to halt or reverse the pathological processes that result in disc degeneration. Therefore, to understand the degenerative process at the molecular level for devising a biologic solution, a reliable model to investigate the cellular changes that initiate disc degeneration is needed. Such a model will assist in evaluating treatments that may be able to halt or reverse the early degenerative process. Several animal-based models of DDD have been described in the literature and employ various techniques to induce degeneration. Currently, the most commonly used strategies involve in vivo techniques with mechanical disruption of the AF [6, 9, 12, 15–17, 30], mechanical stress of the functional spine unit , or chemical degradation of the NP [8, 31]. Other models capitalize on the natural occurrence of advanced DDD in that species . Regardless, the existing models are geared primarily toward mimicking the advanced degenerative changes resembling grade 4 or 5 human discs on the Pfirrmann scale. Although a few in vitro organ culture models that use injury or chemicals to replicate cellular and molecular changes seen during disc degeneration have been reported [24–26], a true atraumatic model that attempts to characterize the early stages of DDD (Pfirrmann grade 1 to 3) has not been available. As described in this study, an atraumatic in vitro model of disc degeneration uses perturbations in several important microenviromental factors that are known to occur during degenerative cascade. The model allows an analysis of reproducible and quantifiable effects at the cellular level by using gene expression, protein analysis, and histology. Another advantage is that this model offers differential analysis of the AF and the NP. Our organ culture DDD model allows analysis of cellular changes that occur in degenerative discs prior to injury or disruption of the AF. Using chemical proinflammatory cytokines and conditions that mimic the normal internal disc milieu (hypoxia, hyperosmolarity, and decreased nutrients), our model shows alterations in gene expression, protein expression, and histological disc architecture resembling human degenerative discs in grade 1 or 2. Gene expression analysis shows downregulation of important extracellular matrix components, including collagen types 1, 2, 6, and 9 and fibromodulin. A similar decline is seen in the expression of the major proteoglycan aggrecan, indicating a slowdown of the anabolic or matrix maintenance phase as seen in human DDD [33, 34]. Furthermore, significant induction in expression of MMP-3, -9, and -13, enzymes that are closely associated with disc degeneration in humans, shows promotion of a catabolic state [35–37]. Importantly, Western blot analysis confirmed the presence and upregulation of degradative enzymes (aggrecanase and MMPs), indicating upregulation not only at the mRNA level but also at the protein level. These results strongly support the notion that early phases of disc degeneration are characterized not only by a decrease in synthetic activity of cells but also by a concomitant increase in production of the mediators that promote a catabolic environment within the disc. The most compelling piece of data that substantiates this model is the histology of the discs at 3 and 10 days after treatment. The progressive loss of the proteoglycan-rich extracellular matrix and changes in cellular morphology and architecture closely resemble DDD in humans. As expected, this phenomenon progressively worsens with treatment duration. Although the disc architecture resembles a grade 3 disc in humans at 10 days after treatment, eosinophilic cytoplasm continues to be seen within the NP, indicating the presence of viable cells. Regardless of treatment duration, significant annular disruption at the structural level was not noted in any of the specimens, indicating a state reminiscent of the early stage of disease in humans. It should be noted that the rat organ culture described here, despite several similarities with the human pathological state, lacks true mechanical loading, although medium osmolarity is raised to mimic loading conditions and to counteract swelling. Therefore, while extrapolating the results from this rat organ culture system to the humans, it would be prudent to consider the inherent differences in tissue size, diffusional distances, and cellular morphology and composition between the species. This study describes an atraumatic in vitro model to investigate cellular and molecular events associated with IVD degeneration by using a rat disc in organ culture. This model may prove useful to those seeking an atraumatic model to use for investigations of early DDD mechanisms and treatment. Ravi K Ponnappan, Dessislava Z Markova contributed equally to this work. This work was supported by a research grant from Biomet, Inc. The authors would like to thank Rhonda Walter for histological analysis. TJA receives royalties from Biomet, Inc. (Parsippany, NJ, USA). The other authors declare that they have no competing interests. DZM carried out the experimental work, analyzed the data, and drafted the manuscript. RKP helped design the studies, secured funding, and co-wrote the manuscript. PJD'A, HBM, ARV, IMS, DGA, and TJA helped design the study and write the final manuscript. MVR designed the study, secured funding, and co-wrote the manuscript. All authors read and approved the final manuscript.